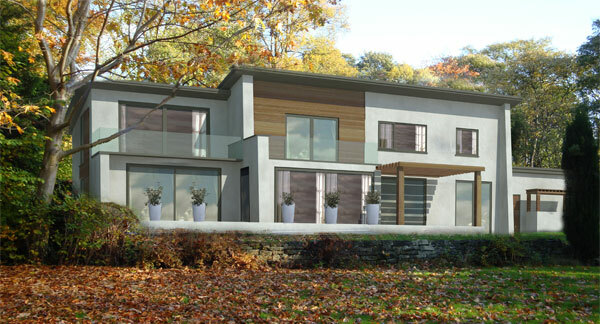 We were originally appointed to provide a full architectural service for this exciting residential renovation project in Baildon, near Bradford. The existing dwelling, originally constructed in 1956 was a contemporary and iconic building of its day, something which was cutting edge and well ahead of it’s time. However, the property had become tired and somewhat dated during recent years, and it’s new owners decided that a very modern overhaul was needed in order to bring it back into the 21st Century. Our first task was to prepare and submit a planning application to Bradford Council for a new first floor extension, along with extensive external alterations which comprised of applying a modern white render to the existing random stone walls, replacing the existing rotten timber windows with striking aluminium framed windows, in a gun-metal grey finish, and the introduction of a number of large sliding glazed door openings with glass balconies at first floor. Cedar cladding panels were chosen to add warmth to the elevations, and the existing flat-roof to the garage will be replaced with a green /grass roof accordingly. The planning application received a good deal of support from local Baildon residents, who were relieved that this iconic dwelling would be brought back into use, and back to life, and would not be bulldozed to make way for a number of new homes, as is so often the case with single dwellings enjoying large garden plots. Architecturally, we didn’t need to alter the structural fabric of the building too much (except for the first floor extension) in order to create the contemporary appearance which the client was looking for. Most of this will be achieved via the introduction of the new finishes. Along with the changes listed above, it is intended to carry out extensive internal refurbishment works and we are excited about adding updates and progress photographs to our blog in due course…..